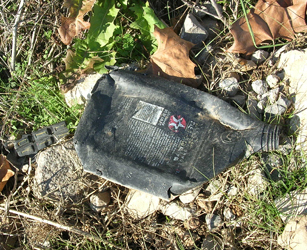 As I was walking the dog the other day, I found this discarded motor oil plastic bottle. Motor oil is considered a hazardous waste. The container was near a creek in our neighborhood where I found mating frogs, eggs and tadpoles last spring. If any oil were left inside the bottle, it would be fatal to the frogs and other wildlife in the creek. Most municipalities have places to take hazardous household wastes as paint and oil. Please dispose of these properly. Prestige Homes is responsible for cleaning up the area in Riverwalk. Apparently many of the residents in the community are upset about the run off during rainfalls from the cleared off area. Seemingly many of the dump sites in my neighborhood are the responsibility of developers who have abandoned projects. I’m really disgusted at these two photos. I think that a group must have had a party on the site where the Ridgetop Townhomes are supposed to be built. There is too much “party” garbage such as plastic plates, beer cans, soda cans, etc. Why did the litterers bag the trash if they were not going to take it away? The bags have been chewed by scavengers such as dead raccoon I found at the site. Last weekend, PlanetTrash took a hike to the Riverwalk neighborhood. There is a road, carved in the hillside, which leads to what their site plan says Ridgetop townhomes, but the construction/sales trailer is deserted. Since we like to climb hills, we took the road to see where it led. Ascending the road, we saw a white tailed deer. At the end of the road at the top of a hill overlooking the Riverwalk neighborhood, there is a clearance with some drainage ditches already dug for the town homes. But the place is deserted and has become a dump. Over the next few days, we’ll present some photos that we took. These photos show the clearance, some uprooted trees and broken aggregate dumped on the land.